NEW YORK Alabama will begin this season the way it ended the last two  No. 1. Nick Saban's two-time defending national champions are top-ranked in The Associated Press preseason college football poll, with the Crimson Tide trying to become the first team to win three straight national titles. Much like the BCS championship game against Notre Dame, the vote was an Alabama landslide. The Tide received 58 of 60 first-place votes from the media panel to easily outdistance No. 2 Ohio State and match Florida in 2009 for the highest percentage of first-place votes received in the 63-year history of the preseason rankings. The Buckeyes received one first-place vote. Oregon is No. 3, followed by Stanford and Georgia, which received the other first-place vote. Notre Dame, coming off a 42-14 loss in the BCS championship game to Alabama, is No. 14. Alabama won its record ninth AP national championship last season, third BCS title in the last four years under Saban, and became the first team to win back-to-back BCS championships. The Tide is AP preseason No. 1 for the fourth time, and first since 2010. The only time has Alabama started and finished No. 1 was 1978, when Bear Bryant led the Crimson Tide to the fourth of its five national championships with him as coach. Now Saban's Tide is trying to accomplish something Bear's boys never could. 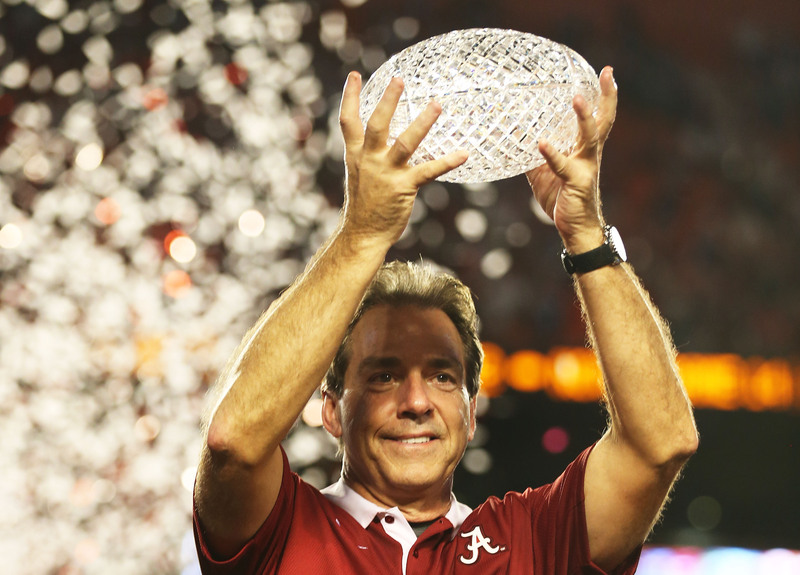 Twice Alabama won back-to-back championships under Bryant, but couldn't get the third. Saban is hoping senior stars such as quarterback AJ McCarron, linebacker C.J. Mosley, defensive end Ed Stinson and guard Anthony Steen have enough memories of what went wrong for the 2010 Alabama team to avoid it happening in 2013. "You're in a position here where we have a lot of players that really haven't lost much," Saban said earlier this week. "They have to really want to be good for the sake of being good. Alabama is 49-5 over the past four seasons, with three of those losses coming in `10. "Most other teams are out there saying we've got something to prove," Saban said. "Well, this team has something to prove. It's a lot more difficult not to be a little bit complacent, not to keep the same accountability to being successful that's necessary. You've got to challenge yourself every day. You've got to challenge each other." Since the poll started in 1936, 10 times has a school has won consecutive AP championships. The Tide's task: complete the hat trick. Alabama will also be trying to run the Southeastern Conference's streak of national championships to eight. For the second straight year, half the top five teams to start the season are from the SEC. Joining Alabama and Georgia are South Carolina at No. 6, Texas A&M at No. 7 and Florida at No. 10. The Tide and Aggies meet Sept. 14 in College Station, Texas. A&M and Heisman Trophy winner Johnny Manziel handed Alabama its only loss last year. Whether Manziel will be eligible for the rematch remains in question while the NCAA investigates the Aggies' quarterback. ESPN has reported Manziel is under investigation for being paid to sign autographs. No. 8 Clemson and No. 9 Louisville, led by two other Heisman-contender quarterbacks, round out the top 10. Tajh Boyd and Clemson take on Georgia at home in Week 1 and are the favorites to win the Atlantic Coast Conference. Teddy Bridgewater and the Cardinals are the heavy favorites to get back to the BCS for the second straight year out of the newly renamed American Athletic Conference. McCarron also makes most of the preseason Heisman contender lists. He passed for 2,933 yards and 30 touchdowns with only three interceptions last season. Now in his third season as a starter, McCarron is the face of the Tide. "Last year there were other people on the offense that had a lot of leadership qualities about them. So it really wasn't quite as important for (McCarron) to always be that guy, even though his position lends itself to that," Saban said. "I think that's a role he can be very good at and it will be important for our team that he is good at it." The second 10 in the preseason rankings starts with No. 11 Florida State. No. 12 LSU gives the SEC six teams in the rankings, more than any other conference. The Big Ten and Pac-12 both have five. The Big 12 has four teams ranked, all between Nos. 13-20, starting with Oklahoma State. Texas is No. 15, Oklahoma is No. 16 and TCU is No. 20. Michigan is No. 17 and Big Ten rival Nebraska is No. 18. Boise State is No. 19, the only team from a BCS non-automatic qualifying conference to make the preseason rankings. The final five are No. 21 UCLA from the Pac-12; No. 22 Northwestern and No. 23 Wisconsin from the Big Ten; last year's preseason No. 1 Southern California is No. 24; and Oregon State from the Pac-12 at No. 25.